Finding low-cost solutions to car insurance becomes increasingly difficult when you have a teen who drives. Drivers age 16 to 24 are the highest-risk drivers in the nation, and insurance companies make them pay for it. In order to economize, you may want to avoid adding your teen to your car insurance policy for as long as possible. But do you have to add your teen to your policy when he or she gets a driver’s permit or a driver’s license. The answer can mean an increase in your car insurance rates of hundreds of dollars. Driving permits allow teens to drive, but under some restrictions: There must be a licensed driver in the vehicle and, in some states, teens with permits are confined to daytime driving only. In addition, a driver’s permit generally expires after 60, 90 or 180 days. Most states have some form of “graduated licensing” law, which phases in driving experience for younger drivers, allowing beginners to gain experience under lower-risk conditions first and then gradually increasing to more complex driving situations. In most states, the graduated period begins at age 15 or 16 and progresses to a full driver’s license by the time the teens reach 17 years of age. For graduated licensing details for your state, see State laws for teen drivers . With a driver’s license, on the other hand, teens can drive alone. Restrictions may include the type of vehicle and whether or not the driver must wear corrective lenses. 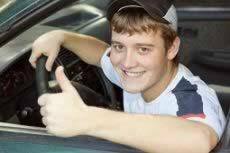 Some states allow insurance companies to require that you list a teen with a driving permit on your insurance policy. Many insurers generally do not charge insurance premiums for teens with driver’s permits, opting to wait until they are licensed drivers, but you should still list them on your policy. Insurance companies will look for a particular date either your teen’s 16th birthday or the date his or her learner’s permit expires to begin charging you for an additional driver. If your teen does not get his or her driver’s license, notify your insurer so that your next car insurance bill isn’t a shocker. You should inform your insurance company when your teen attains a license. However, if you forget and your teen is involved in a crash, it’s unlikely your insurer will deny your claim assuming your teen obtained his or her license after the effective date of your policy. Still, your insurance company can charge you back premiums for your teen from the date he or she received a driver’s license. But if your teen obtained his or her license before you renewed your policy and you failed to notify your insurer, the situation is less clear. Many jurisdictions could consider this a misrepresentation of a material fact and permit the insurer to deny coverage in the event of an accident. The safest course is to notify your insurer as soon as your teen starts to drive. You may be able to save some cash by excluding your teen from your policy under a “named exclusion.” This allows you to exclude your child from coverage under your policy but requires that your teen has his or her own insurance policy and owns his or her own car. (Be careful: If your teen drives your car anyway and crashes, your insurance won’t pay since he or she is an excluded driver.) You’ll also need to make certain this is allowed in your state. Older vehicles generally cost less to insure because repairing them isn’t as costly. Lower risk for the insurer usually translates into a cheaper price for the policyholder. For more information, read 6 steps to buying the perfect car for your teen driver. Excluding collision and comprehensive coverages from the older vehicle’s policy can lower your insurance costs, too. Generally, parents are eligible for more savings and discounts than teens. Ask your insurer for a good-driver discount or a “multiple vehicles on one policy” discount if it applies. Your insurer may also offer a good-student discount (most companies require a 3.0 GPA or higher and it’s designed for teens to young adults ages 23 to 25). So, in some cases, it may be a good idea for you to have your child under your policy. Some insurance companies also offer discounts on your policy if you agree to install electronic devices in your car to monitor your teen, according to III. Savings can also be affected by the kind of car you drive. If you have a Corvette or Camaro, or other sports car, a separate policy that insures your teen on a different vehicle is a good idea. Also, female teens are not considered as high-risk as male teens and will generally qualify for a lower insurance rate.